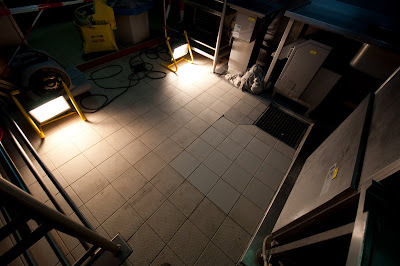 A few weeks ago there was an email sent around the ship asking for some help doing a tiling project in the galley to replace some badly damaged/missing tiles. I have done some tiling before but I've never been in charge of a project by any means but I thought I'd say that I'd be willing to help if needed. Apparently I was the only one who responded and so I was put in charge of doing the repair! I knew I could do it I just thought there would have been someone else who would have had more skill than myself. I've come to find out that on the ship there are so many opportunities to learn new skills and to use the ones you already have and push yourself to get better at what you can do or learn new things altogether. I did some research on tiling and gathered up the supplies necessary and got to work. I had to get the job done as quickly as possible in order to allow the continued use of the much needed pot wash. It went well and I think that I'll be doing more tiling in the future. The tiles that I installed are smooth and there are tiles with a rougher surface for grip on order. Most of the tiles in the galley are the rough ones but we don't have any more on the ship so this is sort of temporary. Hope you had a wonderful Easter! Jesus is risen! You're amazing! The ship is going to weep when you have to leave! You are such a wonderful willing worker and so capable. You inspire me, Ben! Hi Ben, I found your blog through Kristen L. (a friend of mine) and I am interested about this ship "Logo Hope" I have been to the GBA website but I can't find any real details about joining. Just that I have to be 18, I need to raise my own funds, and I need to make a 2 year commitment, but I can't find anything about how much I need to raise. Also are there physical requirements, do I need to be trained in certain things? I don't see anything about this stuff on the website.